The main attraction of the Tango dinner show is the opportunity to enjoy a live orchestra with a group of dancers that could make anyone fall in love with Rioplatense Rhythm. If we add a delicious dinner of bife de chorizo (beef sausage) and the stars we can say that it is a night with all the ingredients of the culture of Buenos Aires. Since 1867 this elegant cafe has been located in the historic center of the city. In 1920 it was founded as a bar and then in 1992 restored. It is now considered by the Museum of the City of Buenos Aires as "Living Evidence of the Civic Memory" and as a "Place of Interest" by the National Tourist Secretary. A la carte: Cold and hot starters; more than twenty options for the main dish; "Finca Flichman" wines, beverages and mineral water; dessert, coffee and a final toast with champagne. 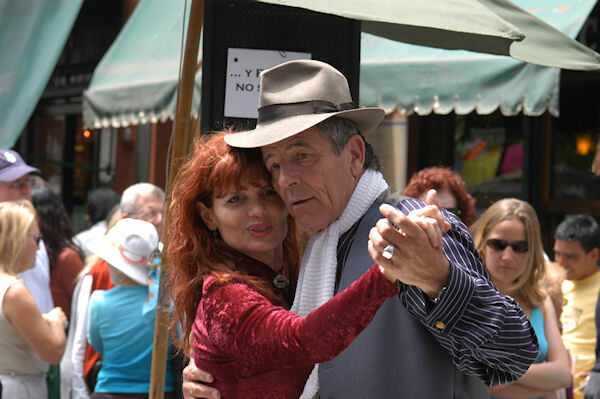 Authentic Tango: The history of the Tango and Buenos Aires - The characters and circumstances from 1860 to the present. The artists on stage are four musicians: accordion, piano, violin and bass and four couples dancing tango with two singers. Please note: The tour ends at a central location, the guide will assist you in getting a taxi back to the pier. The cost of the taxi is approximately $ 8 for the 10 minute drive back to the ship pier. The show starts at 10:15 p.m. and lasts approximately 1 hour and 15 minutes. Remember to bring your camera. Please note: The tour ends at a central location, the guide will assist you in getting a taxi back to the pier. The cost of the taxi is approximately $ 8 for the 10 minute drive back to the ship pier.